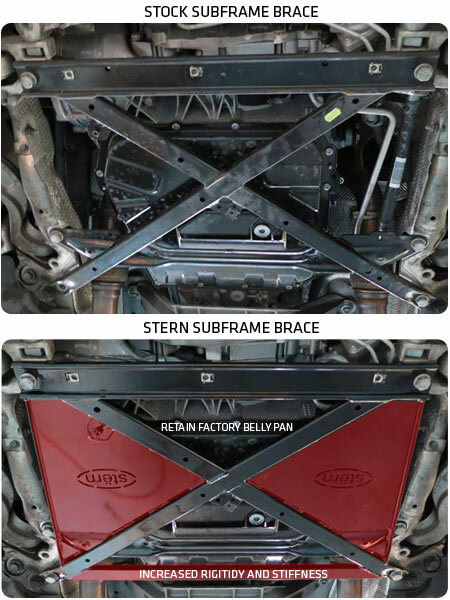 This front lower subframe brace is part of the new Stern line of performance products for the Audi and VW vehicle. This brace replaces the existing lower subframe brace and increases the stiffness by reinforcing the factory part with triangulation and gussets. This improvement can be felt with more crisp steering response, more secure handling through corners, and fewer creaks and groans in the cabin. This brace is a direct fit and requires no drilling or other modifications to the subframe. It allows you to retain the factory skid plates and reuses all the existing factory hardware. Comes complete with a satin black powder coated finish to extra durability.